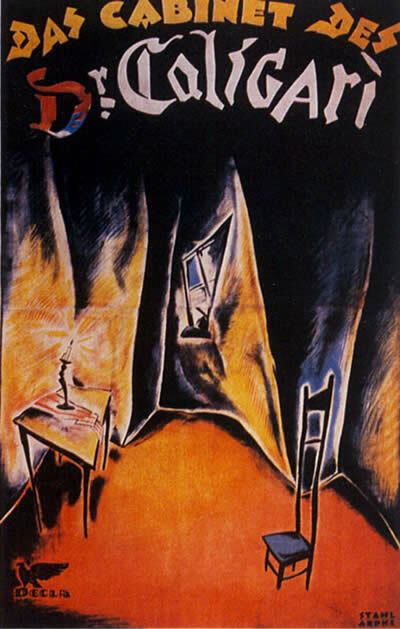 The Cabinet of Dr. Caligari (Das Cabinet Des Dr. Caligari). Decla Film 1920. I find it a fascinating idea to tell a psychological horror story, framed as a man telling his story of how his life was ruined, in a silent medium. There seems to be so much language wrapped up in that concept, and yet a silent film will necessarily tell the story visually and use cards only sparingly. It has the potential to go very wrong, yet from its legendary status I know that’s probably not the case. It also looks like it’s doing some tremendous innovating in stylized cinematography. I couldn’t imagine trying to communicate exotic psychological events with what was available in 1920s technology, but the example frames look like they’re creating some very artistic effects.